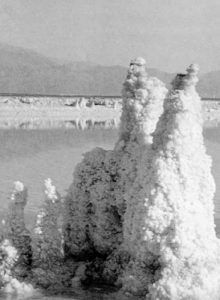 A pillar of snowy salt once stood on the Nebraska plain, about 40 miles above the point where the Saline River flows into the Platte River, and white men used to hear of it as the Salt Witch. An Indian tribe was for a long time quartered at the junction of the rivers, its chief a man of blood and muscle in whom his people gloried, but so fierce, withal, that nobody made a companion of him except his wife, who alone could check his tigerish rages. In sooth, he loved her so well that on her death he became a recluse and shut himself within his lodge, refusing to see anybody. This mood endured with him so long that mutterings were heard in the tribe and there was talk of choosing another chief. Some of this talk he must have heard, for one morning he emerged in war-dress, and without a word to anyone strode across the plain to the westward. He told them that after traveling far over the prairie he had thrown himself on the earth to sleep when he was aroused by a wailing sound close by. In the light of a new moon, he saw a hideous old woman brandishing a tomahawk over the head of a younger one, who was kneeling, begging for mercy, and trying to shake off the grip from her throat. The sight of the women, forty miles from the village, so surprised the chief that he ran toward them. The younger woman made a desperate effort to free herself, but in vain, as it seemed, for the hag wound her left hand in her hair while with the other she raised the ax and was about to strike. At that moment the chief gained a view of the face of the younger woman-it was that of his dead wife. With a snarl of wrath he leaped upon the hag and buried his own hatchet in her brain, but before he could catch his wife in his arms the earth had opened and both women disappeared, but a pillar of salt stood where he had seen this thing. 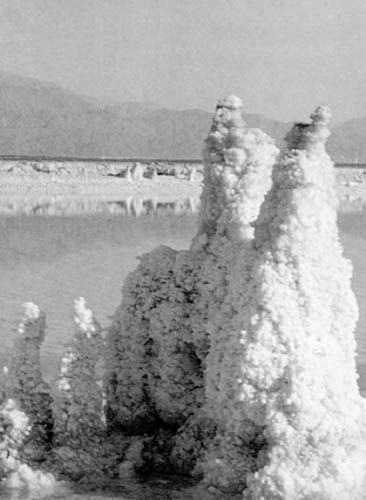 For years the Indians maintained that the column was under the custody of the Salt Witch, and when they went there to gather salt they would beat the ground with clubs, believing that each blow fell upon her person and kept her from working other evil.